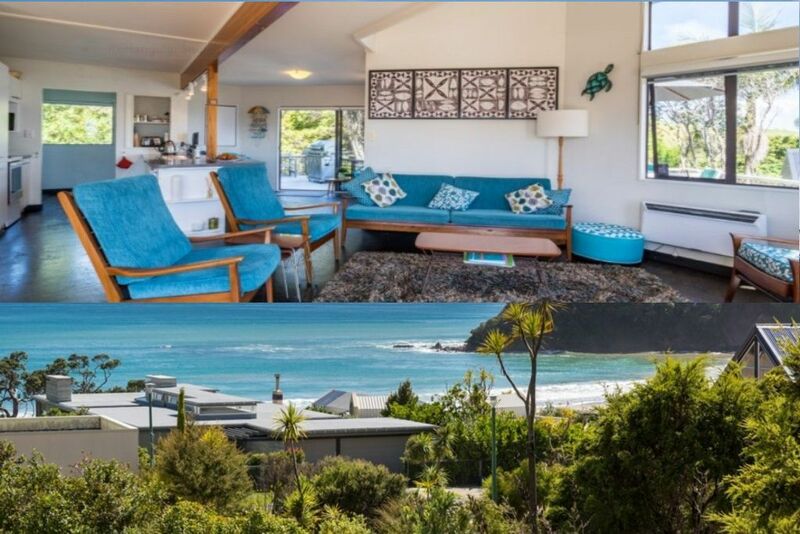 Langs Haven is a sun-drenched holiday home with beach access only metres from the front door, and native bush right behind. This property, located in a cul-de-sac of exclusive homes offers a peaceful family retreat in either summer or winter. The interior combines open plan living with easy access to wrap-around decks where you can enjoy the sea views in front and native bush with bird song/shade to the rear of the property. Downstairs are two double bedrooms with near new queen size and double beds and a generous shared bathroom/laundry and separate toilet. The kids won't want to leave! The property includes off street parking for 2 cars. Surrounding Mangawhai and Waipu Cove/township offer lots of activities - coastal walks, fishing, golf, wine tasting, farmers and craft markets, and cafes including the acclaimed Bennett's chocolate factory. Come and see for yourself why this piece of paradise hooked us! Langs Haven is a comfortable laid-back beach escape. We look forward to sharing it with you. - No parties, smoking or pets allowed on the property. - No tents allowed on the site. We're respectful of our permanent neighbours. In December 2018 after a spate of local break-ins and items stolen from our property, we installed EXTERNAL CCTV cameras to monitor the access points to the house from the street and adjoining land to satisfy insurer concerns. Please be assured there are absolutely no cameras inside the house to respect guest privacy. If you would like further information regarding our security system, please ask. Extensive decking to the perimeter of the property, affording beach / ocean views and westerly views to native bush and farmland. We really enjoyed our stay, great location, view of the ocean, less than a 5 minutes walk to the beach. Very clean and tidy, with everything you need and a gorgeous garden. Would stay again without a doubt! We had a lovely weekend here - would have liked to spend more time but were away at wedding activities a lot. Being close to the sea was perfect in the mornings. Great communication in the lead up - Thanks. Thanks for a great stay it was perfect for our 2 families plus grandparents. A fun house for the kids to explore and a nice flat walk to the reserve and beach. The property was great for our extended family, very clean and tidy on arrival and close proximity to the Beach for the little ones, we also enjoyed the use of the Kayaks. Langs is a lovely Beach and it is close to Waipu and Mangawhai for Cafe's and Restaurants. We had an awesome 5 days and would really love to stay again sometime in the future. Thanks Charmaine, it was our pleasure and appreciate the feedback. Great location and facilities provided.